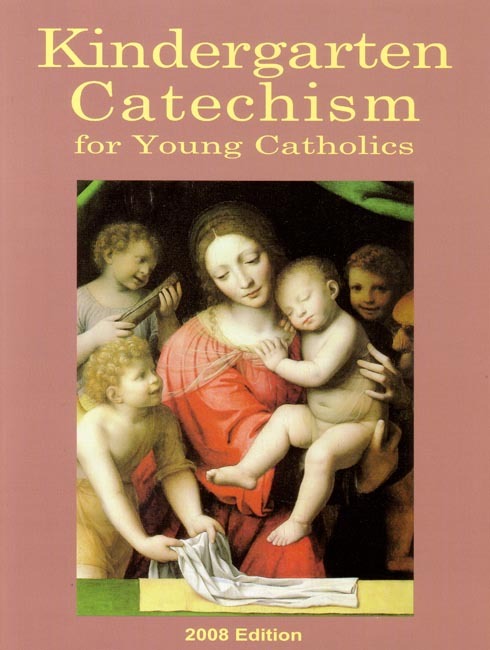 An introductory catechism textbook from Seton Press with full-color pictures from some of history's greatest artists. Included are prayers: Sign of the Cross, the Glory Be, the Hail Mary, the Guardian Angel prayer, Morning Offering, Act of Contrition. Lessons on the Ten Commandments, Sacraments, and the Mysteries of the Rosary. Imprimatur. Full color. 2008 Copyright. 8.5 x 11 inches. Soft Cover. 102 pp. Perfect for introducing the basic and fundamental teachings of the Church. The words are clear and the language simple and accessible to the little ones. Children will refer back to it again and again for the prayers and just to look over the beautiful illustrations. The Archangel Gabriel to Our Lady said "Hail Mary, full of grace. The Lord is with Thee." Not "Blessed art thou among women" like one finds on page 41 of this catechism. St. Elizabeth said that a little later on in St. Luke's gospel. Overall the artwork helps me bring home the information/doctrine I am reading/teaching my son. That's a plus. However, I found several of the answers too wordy for the age group this catechism is intended for, in my humble opinion.